China isramping up for the launch this year of Chang’e 1, a lunar orbiter designed toset the stage for the nation’s future Moon-boundmissions. Assembly ofthe China National Space Administration (CNSA) Moon probe is complete, withtests underway of its rocket booster, according to several state media reports[image]. 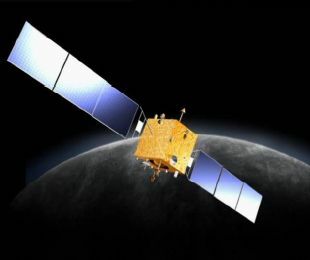 “If everythinggoes well, the Chang’e1 orbiter is expected to be launched in 2007,” a mission overview, one ofseveral attributed to Luan Enjie, chief commander of the China LunarExploration Program (CLEP), stated. The multiple mission descriptions arelisted on the CNSA’s lunar program website. Chang’e 1is slated to launch atop China’s LongMarch 3A rocket from the Xichang Satellite Launch Center in the nation’ssouthwestern province of Sichuan, though no official flight date has been given.The mission is named after a Chinese goddess who, in a popular fairy tale,lives on the Moon. Past reports inChina’s official state media pointed to a planned April liftoff.But recent statements – such as a March 6 report by the Xinhua News Agencyciting Huan Chunping, China’s chief consultant for its manned launch vehicleprogram – indicated the mission may be pushed to the latter half of 2007. Huan wasquoted by Xinhua as stating that China could ultimately succeed theChang’e-1 flight with a manned mission the moon in 15 years (by 2022), thoughsuch an effort depends on the steady development of the nation’s Long March 5 heavy-liftrocket. Chang’e 1 isbased on China’s Dongfanghong 3 telecommunication satellite platform and reportedlycarries a 280-pound (127-kilogram) payload of science instruments for its plannedone-year mission. “In termsof technical configuration, Chang’e 1 is actually a new spacecraft,” Luan wrotein the CLEP mission overviews. Luan statedthat Chang’e 1 carries a total of eight primary instruments to photograph andmap the lunar surface, probe its depth, study the regolith’s chemicalcomposition, and analyze the space environment around the Moon. Accordingto the mission description, Chang’1 carries two basic imagers. A CCD stereocamera will produce three-dimensional images of the lunar surface by compilingthree separate, two-dimensional views of each target area. Meanwhile, the probe’sinterferometer spectrometer imager is expected to overlay optical measurementswith spectra to depict the regional distribution of resources and materials,Luan added. Chang’e 1will also carry a laser altimeter to take precise elevation measurements of thelunar surface, as well as gamma/X-ray spectrometers to hunt out and measure theamount of up to 14 elements – among them iron, potassium, uranium and titanium –according to Luan’s description. A microwavedetector will bounce signals down to the Moon’s surface, operating on fourdifferent frequencies to determine the lunar regolith’s depth, while ahigh-energy solar particle detector and low-energy ion instrument – Chang’e 1’sspace environment monitor system – measures the solar wind environment,according to the CNSA mission description. A payloaddata management system rounds out Chang’e 1’s instrument package. Also ridingto the Moon aboard the lunar probe are some 30 songs, among them Chinese folksongs and “The East is Red” – China’s national anthem – Xinhua reported in November. In thepast, Luan has told the People’s Daily Online that Chang’e 1 carries an overallmission cost of 1.4 billion yuan (about $180 million). CNSAofficials stated that Chang’e 1 is destined to circle the Moon in a polar orbitat an altitude of between 62 and 124 miles (100 and 200 kilometers) [image]. “Consideringthe abnormality of the lunar gravity field, Chang’e 1 may fall on the lunar surfacewithin half a year if a 100 [kilometer] orbit is selected,” Luan stated, addingthat a 200-kilometer orbit will be chosen if mission managers decide not toprobe the Moon’s gravitational field. To reachthe Moon in the first place, Chang’e 1 is expected to launch spaceward into ahighly elliptical orbit that comes within 372 miles (600 kilometers) of Earth at its closest point, according tothe mission overview. Its flight plan then calls for a series of three maneuversto gradually climb into ever-higher orbits for the eventual departure for theMoon. The Chang’e-1mission is reportedlythe first of China’s three-phase plan for lunar exploration, which includesa follow-up lunar lander or rover by 2012, and an ultimate sample return flight[image]in 2017, according to past press reports. China isthe third nation to build and launch spacecraft to ferry astronauts into orbitfollowing the formerSoviet Union and UnitedStates. The country launched its first astronautinto space during the 2003flight of Shenzhou 5, and followed with the two-astronautShenzhou 6 flight in October 2005. A thirdmanned spaceflight, Shenzhou7, is slatedfor 2008 and expected to feature China’s firstspacewalk [image],state media has reported. Huang told Xinhualast week that engineers have completed designing the engines for China’s LongMarch 5 rocket, which is expected to be able to haul payloads of between nineand 25 tons into orbit when complete. Intended to launch a Chinese spacestation, the booster should be ready in about eight years, Huang told Xinhua. Last month,state media reported that China formerly planned to build a new launchsite on Hainan Island in the South China Sea, which some China spaceanalysts have said would berequired for any new heavy-lift boosters. But aChinese manned mission to the Moon will require substantially stronger rocketsthan those currently available, Luan told the nation’s state media last week.